What is this book about? Here is the synopsis! In the distant future a dark force has spread across the universe to our planet, devouring everything in its path. All who have risen to challenge the Shadow, have fallen. For decades the planet has been laid to ruins with no one to fight for it. Now one must rise to the challenge; the last hope for salvation and only remaining guardian for the forces of light is the Last Hero. Blue, green, and pink melted together, and nothing seemed to make sense. He blinked his eyes hard several times and tried to focus. Soon the colors began to separate. He blinked hard again and could ﬁnally make out the sky with a plain of thick grass beneath dotted with daisies. The place was new to him and he tried to move, only to ﬁnd himself struck with infant like strength in a body too large for his muscles. He fought for composure and attempted to remember how he made it there. Nothing. The words came out naturally, without any need to contemplate how to say them. He realized that despite his lapse in memory he must retain some basic knowledge. He did not meditate on it long as he attempted to move again; something deep within drove him to the belief that he could. He felt a sudden burst of strength. Although painful at ﬁrst, he felt joy as he watched his arm rise into the air. He could move. Strength still ﬂowing, the man slowly sat up and took in his surroundings—an endless ﬁeld of pink ﬂowers, a stain among the otherwise barren grassland that stretched beyond imagination. With great care he brought himself to his knees and wobbled to his feet. Falling, he again took in the scenery, this time on his stomach. Once more creating a base on his knees, the man wobbled to his feet, leaning forward with arms stretched out over head: slowly he rose, ﬁghting the gravity that seemed to laugh at his attempt to defy it by standing. However gravity lost this ﬁght, for he stood fully erect. Looking about he noticed only one thing, “The ﬂowers . . . where did they go?” He asked the gentle breeze, which carried no response. J. L. Tracey spent much his childhood in the country playing outside. In the great outdoors, he and his friends would create story-lines with villains to fight. 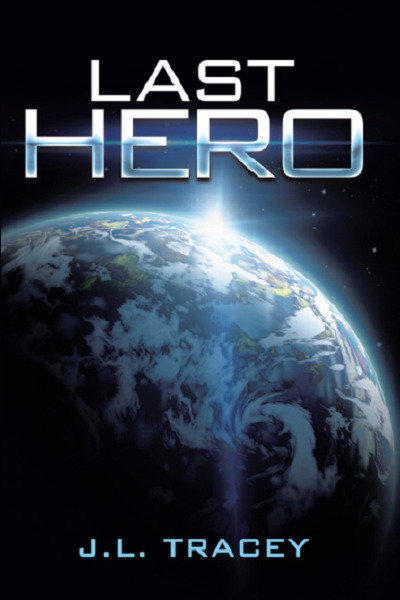 This is where the idea for Last Hero was born. On his own, Tracey never found the passion to write full time as he was busy in the arts and computer industry. However, with encouragement from his wife (whom he met as a teenager) the story-to-be came alive. It was not until an accident where Tracey’s back was irreversibly injured, that his focus became on 'overcoming his injury' and 'writing'.